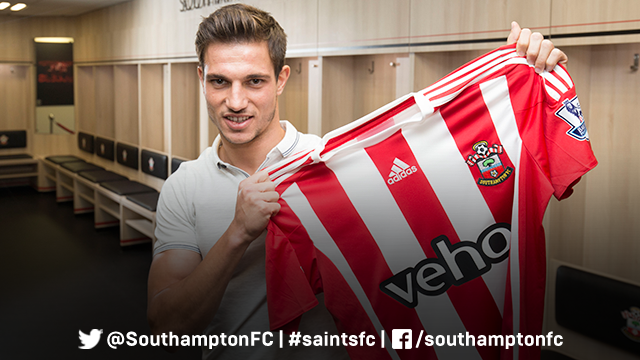 Saints made their second signing in a week, when 23 year old Portuguese international Cédric Soares (more commonly known as just Cédric) was signed on 19th June from Sporting CP of Lisbon on a four year deal. Cédric was born on 31st August 1991, in the German town of Singen, to a Portuguese couple who had met while both living there. The family moved to Montijo, just outside Lisbon in Portugal, when he was 2 years old. At the age of eight, he joined his elder brother Kevin in the youth teams of Sporting CP. Making his senior debut at the age of 19, He started in a 3-1 defeat to Belgian side Gent in the UEFA Europa League in November 2010. However, his first league appearance was not until May 2011, where he started in a home defeat to Vitória Setúbal. Soares spent the following season on loan with another Primeira Liga side, Académica de Coimbra. During this time he made 24 starts in the league, with five in the Taça de Portugal. His last game that season ended in a 1-0 win over his parent club in the final. Having represented his country at under16, through to under19 level, as well as playing at the 2011 FIFA Under-20 World Cup Finals, Cédric made his under21 debut towards the end of 2011. Rejoining Sporting for the following season, Cédric appeared 16 times, with 7 games in the Europa League. He also scored his very first professional goal during this time, equalising in a 1-1 draw at Nacional. He established himself in the Nacional side during the 2013/14 season, scoring just once in 31 appearances, but it was the 2014/15 season in which he really made his breakthrough. Last season saw Cédric make 24 league appearances, as well as three in Sporting’s successful Taça de Portugal campaign, although he was unfortunately sent off 15 minutes into the Final win over Sporting Braga. He also appeared in five of Sporting's six UEFA Champions League group stage matches last season. Cédric received his first call-up to the Portuguese squad on 3rd October 2014, which was the very same day that Saints own José Fonte was also selected for the first time. Cédric subsequently made his international debut, playing the full 90 minutes, in a 2-1 loss to France. In his time at Sporting CS, Cédric scored twice in 93 appearances for Sporting. Prior to signing for Saints, his most recent call up for the Portuguese national side came on the Tuesday before, in a 1-0 win over Italy.